East of Philly concert series organizer John Stewart (left) with Fabian Brown (center) and Louis Marks of Ropeadope Records. Credit: Matt Skoufalos. 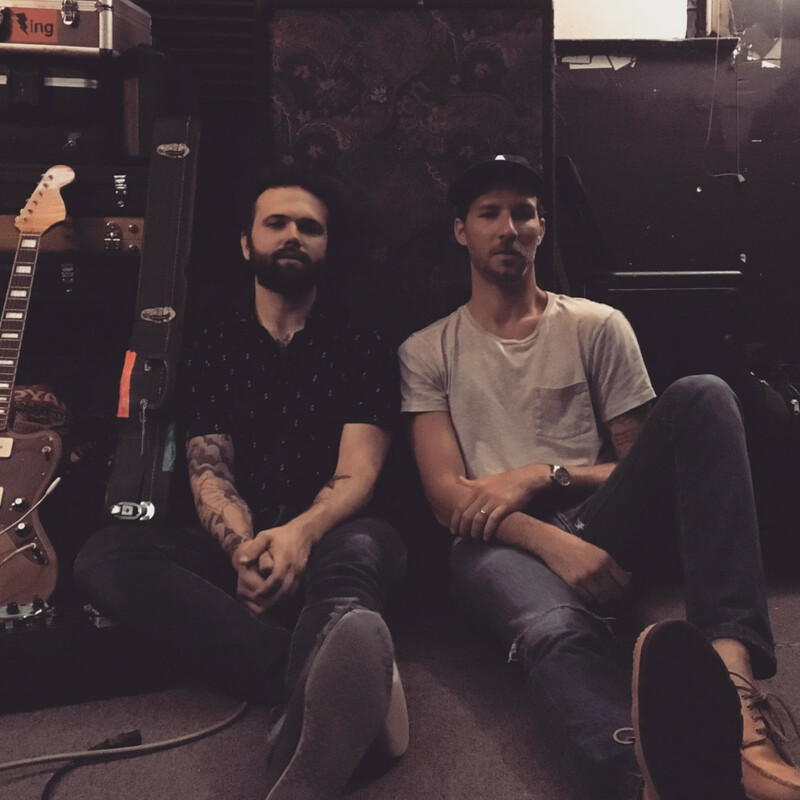 Presented by Collingswood Porchfest and Ropeadope Records, and modeled after the Sofar Sounds house shows, East of Philly will seek to connect original artists and audiences at different small venues. 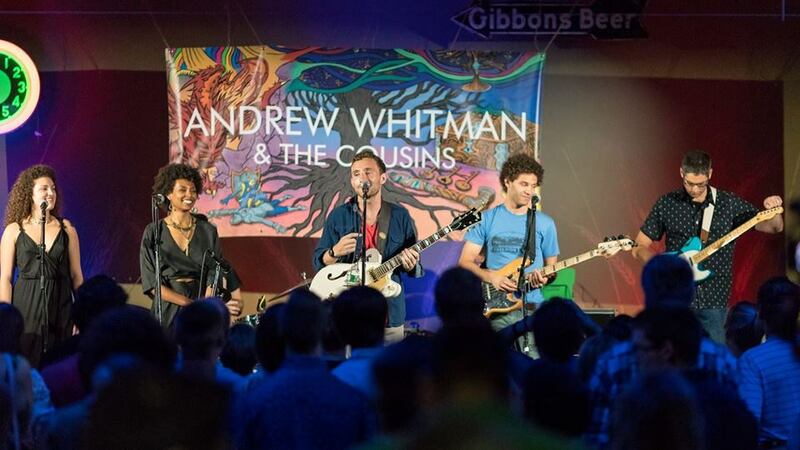 Andrew Whitman and The Cousins. Credit: Andrew Whitman. For an unsigned musician, cultivating a listening audience and a calendar of gigs can be just as big of a challenge as making good art. In a saturated marketplace where label-driven talent dominates radio airwaves and performance venues of all sizes, it can be difficult for smaller acts to find notice. This summer, however, a group of local artists is pooling its resources to open up a handful of nontraditional music venues throughout Camden County to a stable of emergent local and touring acts. The East of Philly Concert Series is the brainchild of musician Jonathan Stewart, executed with support from Collingswood Porchfest organizer Stacey Brown-Downham and Ropeadope Records owner Louis Marks. From May to September, the trio will coordinate a series of monthly shows at small stages in Collingswood, Merchantville, and Haddon Heights. The idea is based around the Sofar Sounds movement, a worldwide network of small house shows designed to connect artists and audiences in non-traditional venues. Tickets are $10, and the events will be coordinated through a mailing list and Facebook event page. Rosu Lup. Credit: Rosu Lup. Stewart’s band, Rosu Lup, plays the inaugural bill May 6 at The Factory with Andrew Whitman and The Cousins, supporting headliner Lewis and Clarke. He hopes that the East of Philly concert series will help showcase their work for a suburban audience. “There’s people already doing stuff that connects Philadelphia to this area,” Stewart said. “The hope is if you’re into music, into discovering new stuff, this might be the first time you see a band, and then next month they’re playing in Philly, and you go and check them out. “The best thing that could happen is that there would be a more sustainable market for touring artists, up-and-coming artists to play,” Stewart said. 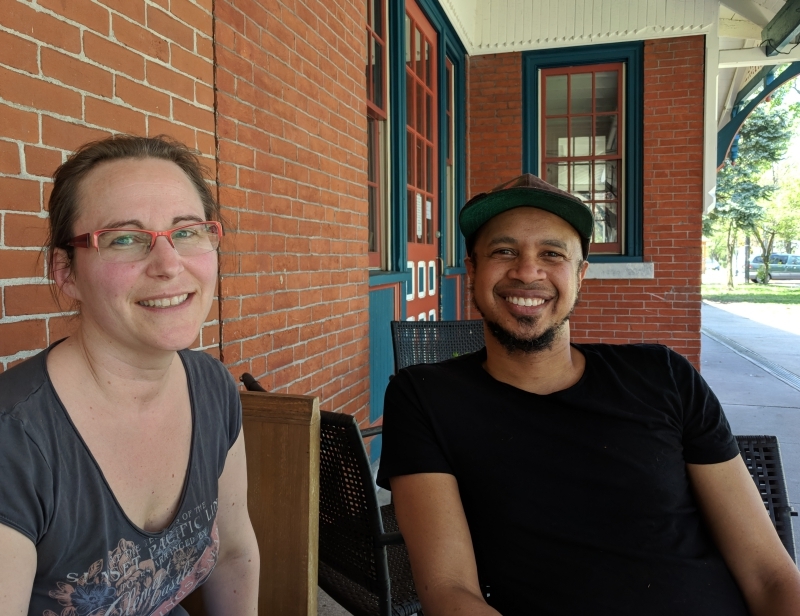 The Station Café in Merchantville, which will host the June 16 concert, was conceived as a way to bring the arts closer to a broad audience, said owners Mat and Nicole Eiland. The Eilands coordinate a town-wide September music festival at the Station, and provide weekly live entertainment for seasonal farmers markets hosted on its front lawn. The Station Cafe owners Nicole and Mat Eiland. Credit: Matt Skoufalos. A café and coffee shop, The Station hosts music and arts classes and contains a second-floor music venue “to support and nurture original music, original artists, and to give people a platform, especially for original music,” Mat Eiland said. “I’m looking forward to networking with musicians and other promoters from different venues,” he said. The Station offers an intimate, small space that Mat Eiland likened to a house concert; guests either sit on the floor or on chairs, “and there’s a lot of engagement between the artist and the audience. Diane Felcyn, Associate Director at Perkins Center for the Arts, which will host the July show date, said the event is a great audience-builder for her organization, too. 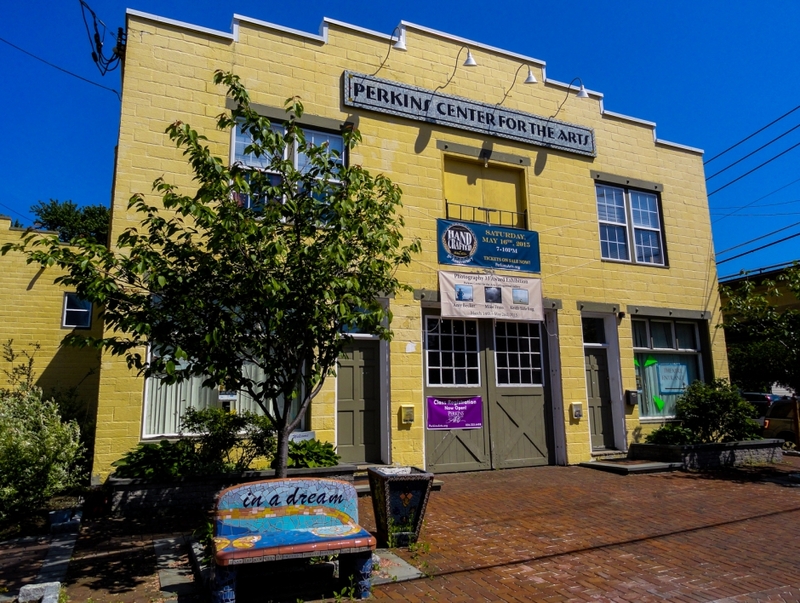 Perkins Center for the Arts. Credit: Matt Skoufalos. “We’re always into anything where the arts are being used to connect to the community in different ways,” Felcyn said. “In this little section of Camden County, it seems like there’s a lot of support for the local musicians that live in the community, and I’ve always loved to help the musicians that are trying to find an opportunity to perform,” she said. “There’s all this cool stuff that people over the bridge don’t see, and there’s a way to experience it and explore it,” Felcyn said. Brown-Downham said momentum from the shows should carry over right into September’s Collingswood Porchfest event, which last year put performers on 40 porches in the borough. Over the winter, she booked some shows at Gradwell House recording studio in Haddon Heights, which will host the August 17 concert, and found a welcoming reception. 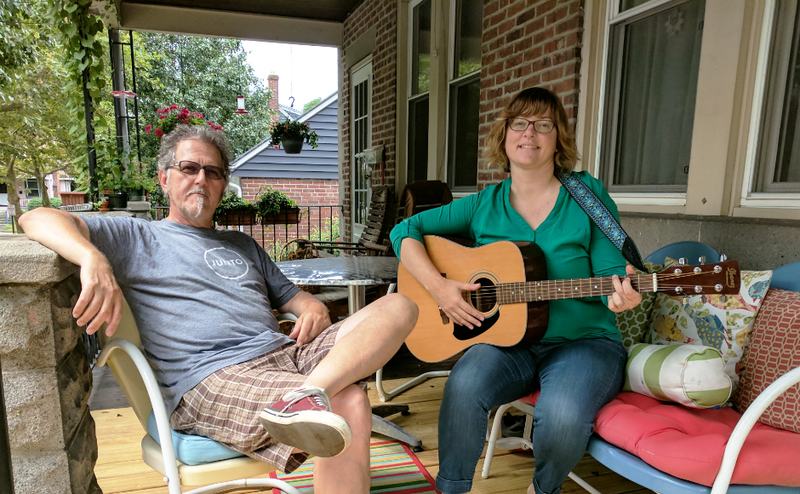 “Porchfest generated such immediate enthusiasm, so it’s clear that there is a strong grassroots music scene in Collingswood and surrounding towns,” Brown-Downham said. Collingswood Porchfest organizers Kevin Monko (left) and Stacey Brown Downham. Credit: Matt Skoufalos. Marks said the East of Philly concert series will help showcase the artists on Ropeadope Records, his independent record label. When touring musicians don’t get the venue access that they might pursue in Philadelphia venues, Marks thinks they could make inroads in the Jersey suburbs, and form meaningful connections with smaller, dedicated audiences at the same time. “You’re challenging the basic wisdom of where you go see music, and that’s a really important shift for musicians,” he said. Marks believes the disconnection of audience and artist is a problem of the commoditization of pop music; restoring those channels can help diversify people’s tastes and expand the market for new talent. By putting professional touring and local acts in front of a mix of audiences in a series of communities, “a scene is what grows,” Marks said. The East of Philly concert series will connect venues in Collingswood, Haddon Heights, and Merchantville through a series of monthly original shows. Credit: East of Philly. May 6 – The Factory (Collingswood) 5 to 8 p.m.
June 16 – The Station (Merchantville) 6 to 9 p.m.
July 13 – Perkins Center for the Arts (Collingswood) 6 to 9 p.m.
August 17 – Gradwell House (Haddon Heights) 6 to 9 p.m.